50 years ago a film was released that became a classic. That film was Lawrence of Arabia. Now you can see it in the cinema after Sony Pictures restored the film to, probably, its original length. Not only do you get to see a restored version of the film, you also get to see it in the original roadshow format, with an overture, intermission, entr'acte [Yes, I did have to look what that meant as well] and exit music. One of the screen's grandest epics, this monumental story recounts the true life experiences of T.E. Lawrence, better known to the world as Lawrence of Arabia. 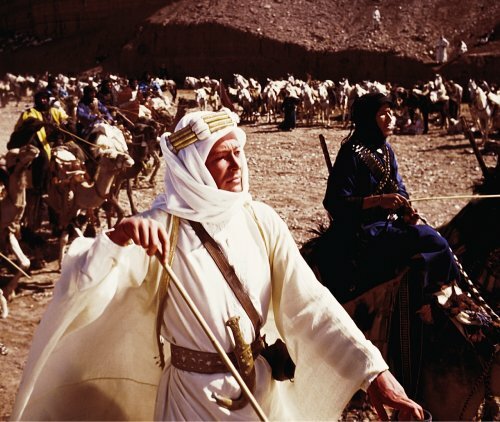 A young, idealistic British officer in WWI, Lawrence (Peter O'Toole) is assigned to the camp of Prince Feisal (Alec Guinness), an Arab tribal chieftain and leader in a revolt against the Turks. In a series of brilliant tactical manoeuvres, Lawrence leads fifty of Feisal's men in a torturous three week crossing of the Nefud Desert to attack the strategic Turkish held port of Aqaba. 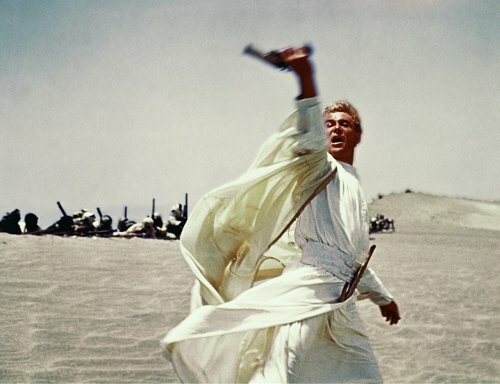 And following his successful raids against Turkish troops and trains, Lawrence's triumphant leadership and unyielding courage gain him nearly god-like status among his Arab brothers.